Utility rates in St. Helens will likely be increasing this year, but the rate is expected to only add a few dollars to users' water bills, according to city staff calculations. During a City Council work session Wednesday, Jan. 16, councilors listened to a detailed presentation from the city's finance director, Matt Brown, that outlined how the city's budget would fare over the next five years if rate increases were approved at either 5, 3.5 or 2 percent — or with no increase. Brown explained that even if storm water and sewer rates are increased by the initially recommended 3.5 percent each year, by fiscal year 2021-22 the city's ending fund balance for sewer and storm water line items would fall below the city's 90-day reserve policy. Brown said that's not likely to happen, however, as changes would be implemented to divert dipping below the reserves threshold. "It's important to note that even if you choose to do nothing, we won't ever get to that point. We will make changes to make sure that doesn't happen," Brown explained. 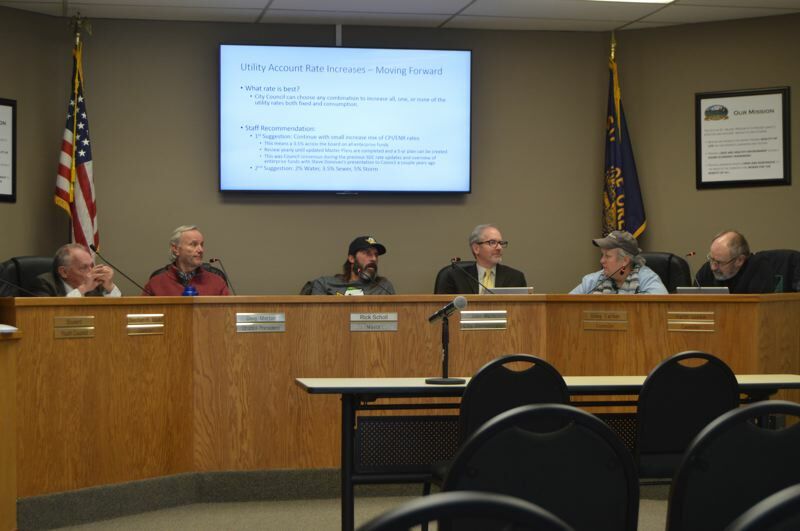 During deliberations, many council members noted that as long as utility rates and budget projections are examined annually, the council will be able to adjust rates to ensure the city's finances are in good shape. Brown's projections indicate that no change in the water rate would still allow the city a fairly level amount of funding, but raising rates over time brings in more revenue. That money is necessary to help pay for future long-term projects, he explained. Brown had initially recommended raising utility rates by 3.5 percent this year, but also suggested a second option where water, sewer, and storm rates — fees encapsulated in city water users' utility bills — would all be increased by different amounts. Mayor Rick Scholl seemed to favor that concept, rather than a single rate increase across all funds. He suggested raising water and sewer rates by 2 percent each, and storm water rates by 3.5 percent. Scholl calculated that his December residential water bill of $151.91, for example, would increase to $156.49 at those rates. Most of the council agreed with the recommended rate change, but the new rates will only be finalized with a formal resolution next month. Councilor Keith Locke suggested including a historical summary in outgoing city water bills of how the city's water rates have changed over the years and the circumstances that previously led to huge increases in water rates. "If you understand why we're there, you aren't so mad about it," Locke said. The City Council is also expected to hold a public forum in February before the resolution would be voted on.